These Crystal River Cruises fare must be booked before 30 April 2019. (*) Fares are per person cruise-only. For UK & Eire residents: Cruise-only fares are in Pounds Sterling and include cruise taxes, fees and port charges. Optional flight add-ons are available from designated UK airports. Crystal River Cruises’ All-Inclusive fares include beverages including fine wines, champagne, premium spirits and all nonalcoholic beverages such as bottled water, soft drinks and specialty coffees; gratuities for housekeeping, dining and bar staff; personal Butler service; airport transfers to and from the River Ship, choice of one of two complimentary shore excursions in each port and complimentary Wi-Fi Internet for the duration of your voyage. Depending on sailing and category booked, Solo supplements range from 30% to 100% on top of the applicable per person double occupancy fare. Solo Traveler Fares are calculated before other promotional savings. For availability and detailed itineraries please email info@culture-cruises.com or call Kevin or Suzy at Culture Cruises on 020 7660 1450. 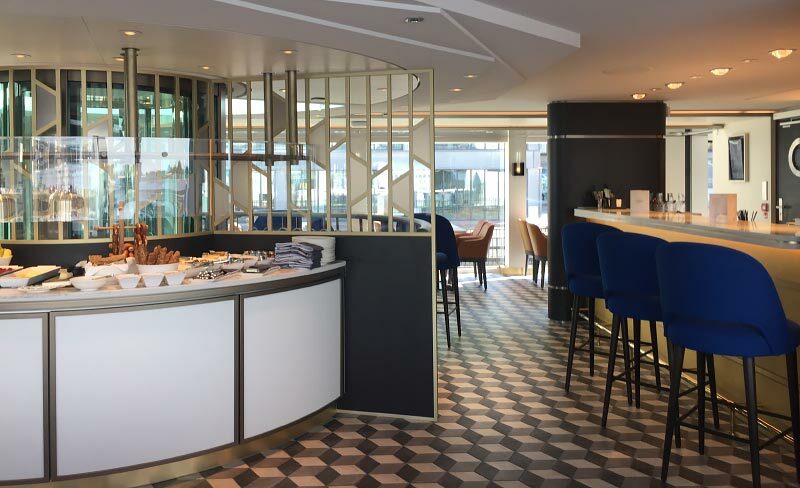 On Tuesday, four cruise agents from the UK, including a representative from Culture Cruises, flew to Amsterdam to inspect the latest Crystal River cruise vessel, Crystal Debussy, and enjoy a leisurely lunch. As you will see from our photos it was a sunny day. Below is the Palm Court, the main lounge of the Crystal Debussy and her three sister ships. The Palm Court, which can accommodate all 106 guests at the same time, is outfitted with skylights on both sides, allowing daylight to brighten the whole room. This lounge also boasts a full-size Steinway grand piano. Unusual for river craft, the Crystal Debussy and sisters have a swimming pool, as well as spacious spa and gym. The pool is a counter-current swimming pool so you can swim to your heart’s content. The midships Bistro has windows both sides for views of the river and its shores, not to mention the ship traffic. As well as a daytime haunt, the Bistro becomes a Tapas bar for informal dinners, reservations required . Finally, the accommodations are all large, on a ship with lots of space. Below are the lounge and bedoom of a Category C Suite. Other rooms have convertable balconies with outward-facing beds from which to enjoy the passing river views. 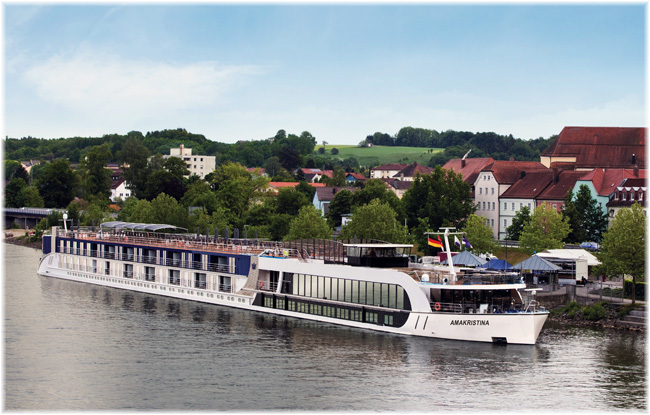 Thus you can wake each day to enchanting panoramic views aboard this elegant all-suite ship with river cruising’s largest standard accommodations. And enjoy award-winning service, farm-to-table cuisine and enriching discovery bridging ship and shore. With the highest staff-to-guest ratio among all European river lines, and professionals chosen for thire expertise and friendly demeanour, Crystal’s genuine hospitality sets the stage for a journey beyond compare. This is a place where luxury is comfortable, and where supreme indulgence creates a sense of well-being. Day breaks with new views, and night falls into a dreamy slumber in your beautiful spacious suite. Cuisine transcends mere excellence and enters the sublime. Menus of Michelin-level envy are sourced with the freshest ingredients and paired with the finest wines. Every meal is a celebration. We will post some Crystal River offers on the weekend so keep your eye out.